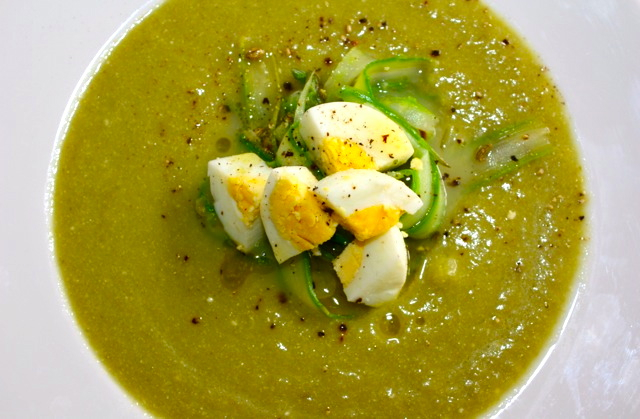 This vichyssoise recipe has been on my mind for ever, but for whatever reason I never managed to finalize it. I have always wanted to make a vichyssoise, but a different version from the traditional one which is made out of leeks, potatoes, milk, parsley and consumed cold. Its origin is unclear, so I will not discuss something that we don’t know. One thing I know is that it’s delicious, no matter where it originated from. 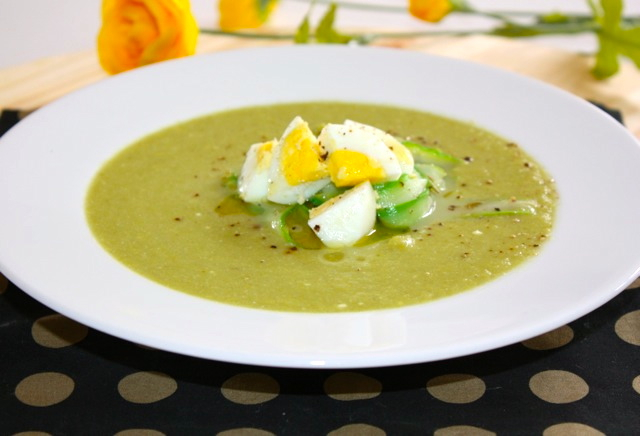 This vichyssoise is served with a salad of asparagus placed in the middle of the plate, which gives an crunchy texture to the velvety soup. Soups are considered a meal that is supposed to warm you up, so the notion of cold soup is not very appealing to some people. Soups are so nutritious and delicious that they don’t have to be enjoyed only in winter. Here is one to enjoy cold, warm or hot. But if it’s hot, don’t call it Vichyssoise! Heat olive oil in a pot. Add onion and cook slowly until translucent. Add leeks and potatoes. Cook stirring for about 5 minutes. Add broth. Cook for about 20 minutes, then add asparagus. Cook for about 5 min or until tender. Adjust with salt and pepper. 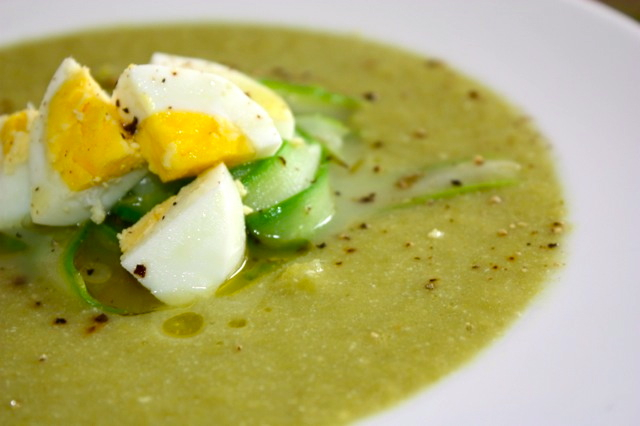 Using a blender, mix the soup to obtain a smooth texture. Add yogurt or cream. Let it cool and place in the refrigerator to chill. Bring a small pot of water to a boil. Using a mandoline cut, asparagus lengthwise to form ribbons. Cook asparagus in water for 30 seconds, drain and set aside. In a small bowl, mix all ingredients except for the eggs. Add eggs at the end. Serve soup cold, with a spoon or two of the salad in the center. This entry was posted by silvia on July 4, 2016 at 5:26 pm, and is filed under Soups, Vegetarian - dairy. Follow any responses to this post through RSS 2.0.You can leave a response or trackback from your own site.